Greetings, travelers! 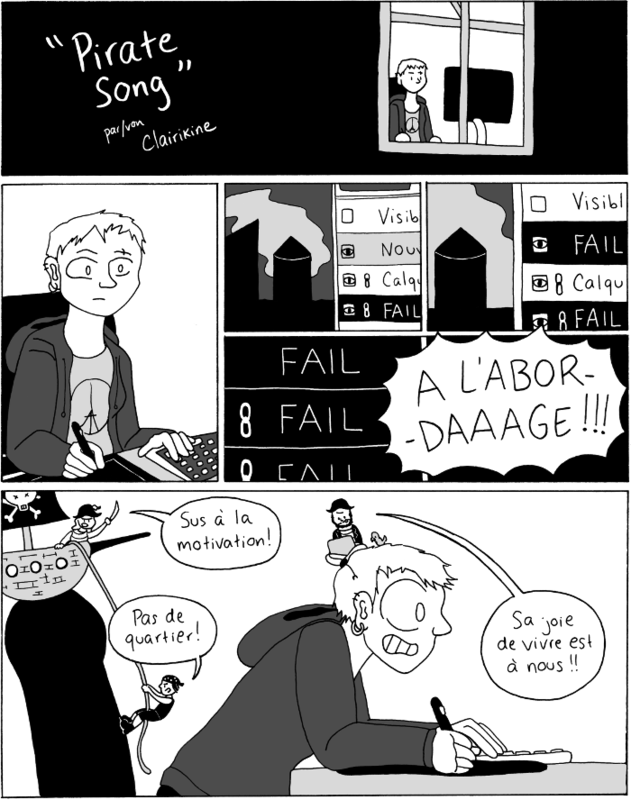 I am Clairikine, a Franco-American Berlin-based cartoonist who speaks too many languages. I have been making comics in an online and self-published capacity since 2011, though I have decorated many notebooks and lecture note margins with comics since my childhood in Southeastern France. 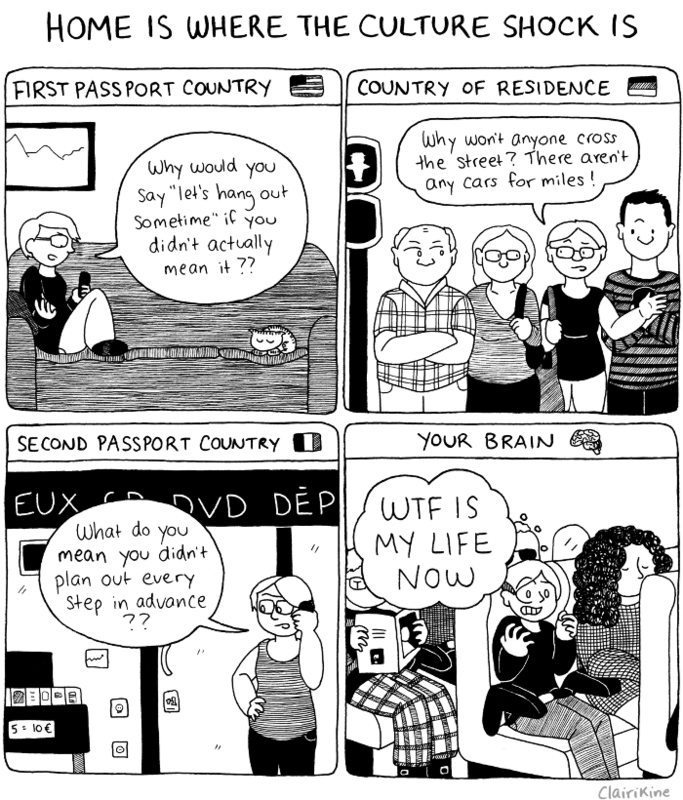 I love making comics that help both myself and others to process various aspects of life; these often revolve around feelings and relationships, but also the experience of living across many cultures. The vast majority of my comics work is on my blog, which I currently update at least once or twice a month. In 2015 I completed Master of Survival, an autobio comic in 20 short episodes and 3 languages about my 2010 move to Berlin. I’ve contributed work to Travels of Adam and Electronic Beats, and I regularly contribute fictional comics to the Franco-German comic zine BETON. I've also taken a liking to producing live-drawings and sketch notes of events I attend in Berlin. In addition to holding down a part-time job at a small software company, I work as a freelance cartoonist, translator and project manager. While this offers me a certain flexibility, personal projects must often be put on hold in favor of paid work. Through an accumulation of small monthly donations, this Patreon campaign can help me carve out more time during the week to work on long-form stories and short comics. Whether or not you pledge to this campaign, the content it supports will continue to be made available for free. But as a thank-you, patrons are given access to a variety of exclusive content not seen elsewhere on the web - personal updates, thumbnails and other works-in-progress. Subscribers at higher levels also receive a digital copy of my monthly sketchbook - life drawings, character sketches, doodles, the works! Patreon offers a great venue for involving folks behind the scenes, and I want to make a point of doing so. With your help, I can continue to work and improve on what I feel I do best - making comics from the heart, in one language or more. Thank you for reading, or, if you like - herzlichen Dank, merci beaucoup and tack så mycket! The warm fuzzies for supporting my work! You get access to an exclusive monthly newsletter with updates from Clairikine HQ, works-in-progress and behind-the-scenes info, as well as to my journal comics! Clairikine HQ Membership + Sketchbook! An exclusive monthly digital sketchbook!